Auxerrois is most unknown grape, mainly because it usually mixed and sold in Pinot Blanc blends, more rarely pure in their own name. The variety stems from Gouais Blanc, a Croatian grape that have been crossed with varieties from the Pinot family to give rise to, among others, Chardonnay, Aligoté (the Kir base of Burgundy), Melon (Muscadet), Gamay (Beaujolais), and the almost extinct Alsatian variety Knipperlé. 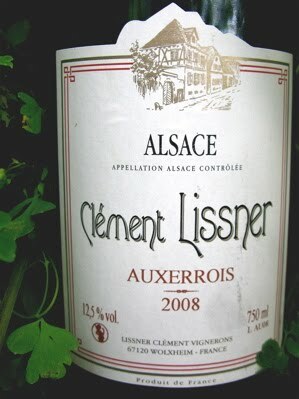 2008 Auxerrois has a welcoming, complex aromas of melon, toasted pumpkin seeds and ripe pineapple. The taste is excellently well-balanced, with a fresh and lovely acidity that gives support to the beautiful peachy fruit. The aftertaste has a backbone of tartric acid, which provides structure and freshness, which is unusual for a Auxerrois. 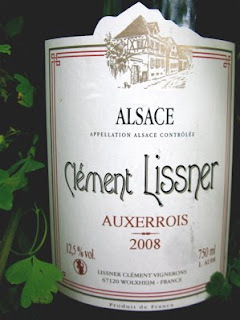 A superb wine, whatever yardstick, from one of Alsace's most interesting producers. Price: € 4.50.